Remember when Cryptic and Perfect World told you about their upcoming "Season 6" update to Star Trek Online? No? Well, it's up now, they've got a trailer to tell you all about it. In case you can't load it, the update's pretty big, and its party piece is the ability for player fleets (guilds) to build their very own starbase, an upgradeable space station that provides services and that warm feeling you get from having your very own home...in space! 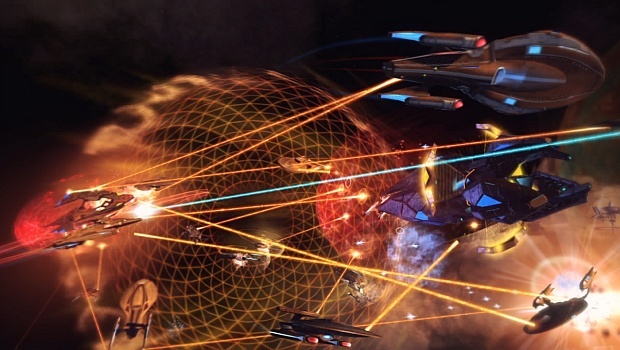 The update also promises more content for high-level players, including five- and twenty-man raids, an upgrade to the Foundry (a tool for player-created content) and new features designed to give more activities unique to player fleets, including defending their starbase from enemy attack. With all this new fleet-centric content, I suppose it's time to re-found my own fleet, The Borg-eoisie, with its flagship, the U.S.S. Ury, which roams the stars, loaning desperate people money at ridiculous interest rates, breaking their fingers (or tentacles) if they don't pay up.